Many users love that the Nike Air Huarache Ultra has a snug fit because it makes the experience of wearing them extremely comfortable. Majority of wearers have expressed interest in the upper’s neoprene mesh material. Some buyers love packing the shoes when traveling as they are lightweight and folds easily to fit in a travel bag. It comes in many color variations that suit various outfits. A couple of reviewers like the Air sole cushioning as they are incredibly comfortable with superior cushioning yet provides the same durability as other midsole material. A few customers claimed the Nike Air Huarache Ultra is comfortable enough for extended wear. The comfort and fit are well encapsulated in a very reasonable $115 price tag. Commenters online loved the shoe ventilation brought about by the three-layer mesh and perforated foam upper making the sneakers more breathable than the original Huarache. A loyal fan of the women’s and men’s Nike Air Huarache Run Ultra casual shoes says the kicks’ availability in different sizes made them decide to buy Huaraches for the entire family including the children. Several wearers with flat feet loved the removable insole feature as they can replace it with custom-made orthotics. Runners love this extremely light shoe that is suitable for the track, in the gym, and even in the basketball court because of its good ankle support at the back. Many women like wearing these shoes due to their summer-ready colorways that brighten any outfit like active wear and sports clothes. One negative reviewer claims the Nike Air Huarache Ultra makes so much squeaking noise when used. An online critic panned the shoe sizing for having too much room in the toe box which becomes uncomfortable for those with narrow feet. An online buyer says it is better to buy these shoes in actual stores than on the internet as fitting cannot be perfected when these shoes are bought online. The Nike Air Huarache Ultra, a stripped down version of the iconic Huarache shoes, is popular than ever as it maintains a lightweight and durable finish. With excellent materials, this version is well-loved for being comfortable and breathable. Its design is sleek yet stylish. The rubber pods in the outsole offer added cushioning and durability while the heel counter serves as excellent support, particularly at the back of the shoe. While it may have some minor flaws, what draws many sneaker loyalists to this design is its very reasonable price tag. It was in 1991 when the Nike Air Huarache was officially launched and gained immense popularity. Veteran footwear designer Tinker Hatfield, the man behind other favorite Nike releases such as the Nike Air Max 90 and several Air Jordan designs, designed the Huarache after watching water skiers and the neoprene material that they have been wearing. The Swoosh brand conducted marketing campaigns brazenly declaring that “The Future is here. In sizes 6 to 15.” Those words will seem prophetic considering how much of a running and lifestyle icon the Huarache turned out to be a few decades later. However, the name Huarache itself almost never came to be as Hatfield initially referred to the shoe as the “Harrachi,” which is the name of a Native American sandal. The original Huarache design, however, is stripped of outlandish technology and aesthetics but focused on giving the bare essentials. This minimalistic focus on the design and not to the brand almost left out the iconic Swoosh logo which has been relegated to subtle and practically unnoticeable placement in the shoes to focus more on the technology and not on the brand. Other famously Huarache-inspired shoes include the Nike Mowabb and the Air Jordan VII. The original Huarache shoe also became even more popular as it crossed over from being a running to a basketball shoe with the likes of Chris Webber, Reggie Miller and Scottie Pippen wearing the shoes on the court. The shoe, at one time, was also worn by comedian Jerry Seinfeld in his hit TV series making them one of Nike fans’ favorite pair. When the Nike Air Huarache Ultra sneaker was released in 2015, it came out in women-specific sizes but later on offered designs that are also wearable for men. The women-specific profile of the sneaker featured modern upgrades like a Dynamic Flywire and a re-designed sole unit with a lower profile compared to the OG Huarache sneaker. The first colorways that came out include the Hyper Turquoise, Black, and Bright Mango colorways. The Nike Air Huarache Run Ultra was also offered in a Stealth Grey colorway. The Nike Huarache Ultra “Stealth Grey” featured a seamless woven upper while retaining the signature heel cage but with a slimmer design with a bold Nike branding. The OG Nike Huarache colorways were also featured in the new Ultra version. These include the Nike Huarache Ultra “Scream Green,” Nike Huarache Ultra “Pure Platinum,” and Nike Huarache Ultra “Royal Blue” colorways. Also paying homage to the 1991 OG Huarache Medium Berry colorway, the Nike Huarache Ultra was released in “Medium Berry” colors that combine Purple Dynasty, Black, and Hyper Volt tones in the upper. As the design also packages itself as a perfect summer sneaker, the Nike Huarache Ultra shoe was also executed in bright sunset trio colorways. The tonal colorways featured flashy purple and orange hues for the ladies. Another summer favorite is the Nike Air Huarache Run Ultra “Fiberglass” as the women's exclusive sneaker has minty and aqua tones in pastel shades that are contrasted by an electric green heel strap. With the success of the Huarache Ultra, the Swoosh brand also released a breathable and summer-ready version called the Nike Air Huarache Ultra Breathe in 2016 with a well-ventilated mesh upper with a “Triple Black” colorway among others. The year 2016 was also the release of the “Triple White” Nike Air Huarache Ultra. The foot-hugging stylish design and the relative comfort of the Nike Air Huarache Ultra have made it even more famous for running, training and also just for casual wear. The sneakers upper takes in the form of a Neoprene bootie perfectly blended with mesh that gives a snug fitting without sacrificing performance. Shoe manufacturers added synthetic leather backing for the needed support and beautiful detailing to this ultra-comfortable shoe. Style-wise, the Nike Air Huarache Ultra first came out in the women’s line and then followed by the men’s line in 2015 initially with just a few colors to choose. But despite this, the Nike Air Huarache Ultra has gained a steady and loyal following due to its extreme comfort and performance from the cushioning, fit, breathability and lastly, because it is super lightweight that wearing them would be a welcome respite from long walks or strenuous gym activities at summer time. Here’s a more detailed styling suggestion of the Nike Air Huarache Ultra for men and women. While the Nike Air Huarache Ultra first came out in women-specific sizes and colorways, it finally gave to the male audience when they released them in OG-inspired Huarache colorways. To style the Nike Air Huarache Ultra men’s sneaker in black and grey colorways, men may opt for pairing them with joggers and ankle pants to highlight the silhouette of the sneaker. Usually, male sneakerheads wore less bling and toned down shirts and pants to make the unique colorways of the sneaker shine through. Neutral colored versions of the Nike Air Huarache Ultra, on the other hand, can be worn with extra flashy colors and accessories due to their minimalist treatment. With some bright colorways for the Nike Air Huarache Ultra women’s shoe, most female wearers of these sneakers often pair them with leggings, joggers, yoga pants, shorts, and street-style skinny jeans for a more relaxed and summery vibe. The running-inspired sneaker is also best paired with gym training clothes for an athleisure vibe while some would prefer wearing these kicks for some casual dates and daily commutes in the urban jungle. The Nike Air Huarache Ultra fairly runs true to size. It has a snug fit brought about by the sock-like neoprene material that secures the shoe into the ankle and a lacing system for a better fitting shoe. The shoe also includes a removable insole. Shoe sizes are available for men and women. The men’s sizing ranges from 6 to 13 while the women’s are from 5 to 11.5. For the reincarnation of an iconic shoe of the nineties, the Nike Air Huarache Ultra is a blend of new premium materials but still bearing the DNA of the original Huarache. The shoe has remained the same regarding its looks retaining the lateral and medial side from its rubber materials with Swoosh branding at the back heel. The upper is composed of a unique blend of a three-layer mesh and perforated foam Neoprene material while no-sew overlays on the toe and quarter complete the shoe’s look. To make it even lighter than its previous installations, the Nike Air Huarache Ultra has a molded saddle retained from the original design but used modern elements such as a Flywire cord to keep the mid-foot secured with a snug and perfect fit. This time around, the designers only used rubber gum soles on the front and tip of the shoe while a core midsole holds everything together to reduce overall weight. An Air-Sole cushioning helps give the much-praised lightweight comfort while rubber pods at the bottom provide durability and traction. Regarding quality, the Nike Air Huarache Ultra has no-sew overlays on the toe with a slimmed down one-piece neoprene upper reducing any added weight compared to the previous design with numerous panels. 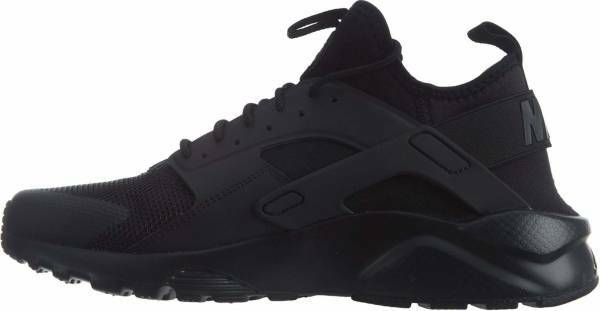 Celebrities such as Orlando Bloom, Bow Wow, Nicki Minaj, DJ Envy, Drake and Justin Bieber were seen wearing a pair of the Nike Air Huarache Ultra.